In this week's new Martin and Sylvia's Nature School story, "Song of the Hermit Thrush: Part One," it is the last day of Goose-eye Wilderness school before Summer Vacation begins. Martin learns that he will be a part of a new group of children – one formed not by age, but by "who he is." He learns that there is a Mockingbird group, a Hermit thrush group, a Crow group and a Hummingbird group - and when he hears Chick describe them, he thinks that he belongs to them all! Which will be his group? The last day of camp or school or any event that brings people together is such a special one. We hear about just such a day this nature school story. In the beginning of the story, Martin and the other children are concerned about not having enough time to spend with their friends. That inspired me to create a sundial. A sundial is a way to keep track of the time using the sun. 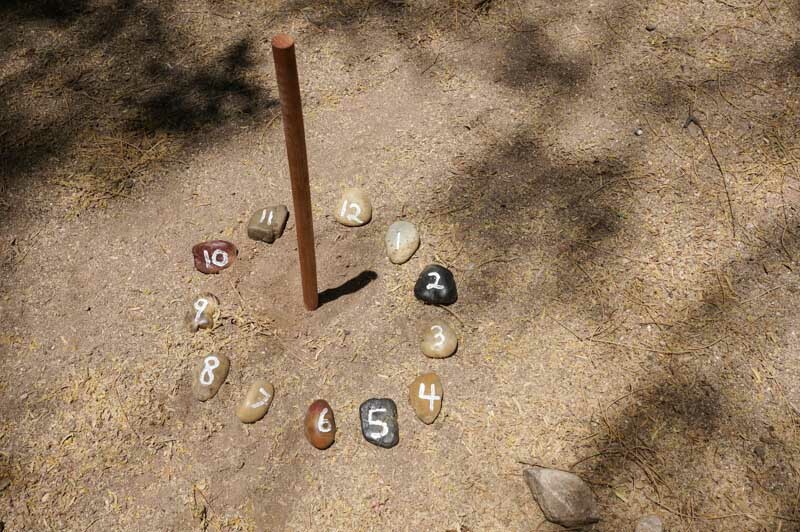 Creating your own sundial can be as simple or as complicated as you want it to be. For this tutorial, I used some stones and a wooden dowel. You could also find a straight stick or cut a triangle out of cardboard to be the gnomon (part that creates the shadow). Starting a noon, find a sunny spot in your yard. Plant the dowel or stick standing straight up and down. 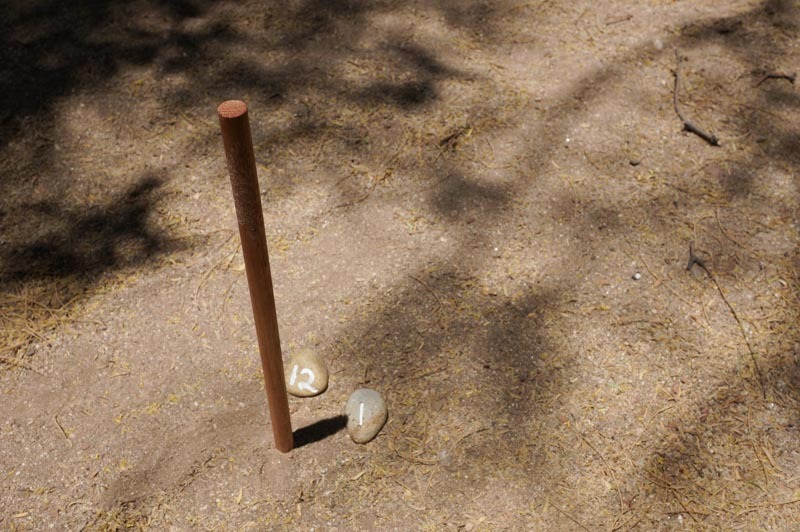 Place a stone at the end of the shadow cast by the stick. Repeat this step every hour until the sun sets. You'll find that the shadow will have moved each time. At this point, you will only have completed half of the sundial. Return the next morning to mark your shadows on the hour from sun up to noon. Now you or your children can check the time whenever you are outside. The morning hours will be on the lefthand side, while the afternoon hours will be on the right. 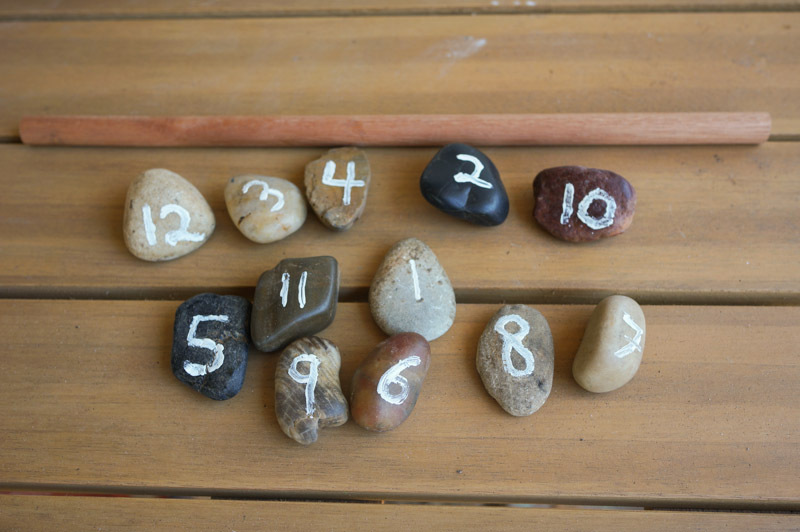 To make it easier for smaller children to connect the movement of the sun to the passage of time, I have placed the numbered stones in order like a clock. If you have older kids, they might be interested in creating a more scientific sundial – in which case you'd want to cut out a gnomon (or triangle) and then start from 6am and work forward throughout the whole day. To make a gnomon, cut out a 6in x 6in square of cardboard. Make a diagonal line from one corner to the opposite corner. Cut along the line and you have your triangle! You can glue this triangle on another square of cardboard to make it stable and mobile. How will the shadows change at different times of year? Will they get longer or shorter? Did the spot you chose at noon still have full sun at 3pm or 6pm? Does it have full sun in the morning? Will your sundial work when it's cloudy?